A Merry Xmas to you Werk and your family, as well as all the members and contributors of this forum!! A happy New Year in advance, wishing everyone all the best in their projects, personal and professional as well as weather related ! 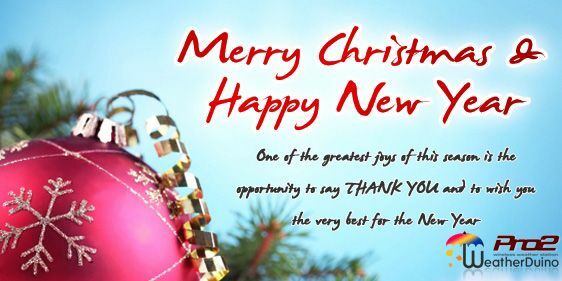 I'd also like to wish everyone in forum Merry Christmas and happy New Year and especially to Werk_AG and his family! I look forward to new ideas from forum members and further cooperation in putting them into practice. And everyone also good health! A very Merry Christmas to all from down here too! I hope everyone has had a fantastic year and the nest year will be even better! Thank-you Werk for the ongoing support and development of WeatherDuino. A very Merry Christmas and Happy New year to you and everyone on the forum. A very Merry Christmas and Happy New Year to everyone involved in this wonderful project! Current time: 26-04-2019, 08:50 Powered By MyBB, © 2002-2019 MyBB Group.